Description of "THE TIME VALUE OF MONEY - CONCEPT , PROBLEMS AND SOLUTIONS"
( c ) illustrates 38 number of problems with solutions . The author is working as an Assistant Professor in Commerce in a degree college in West Bengal , India . 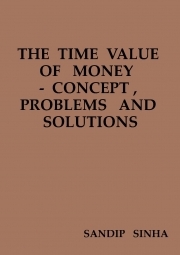 Reviews of "THE TIME VALUE OF MONEY - CONCEPT , PROBLEMS AND SOLUTIONS"